We’re already seeing examples of one of the biggest trends of 2013—authentic storytelling. Marketing campaigns are getting more and more personal, with real stories from real people. You may be surprised—or not—to know that one organization leading the way is the U.S. Army. Recently, I came across a campaign from the 1st Infantry Division that aims to tackle suicide prevention among soldiers in a more effective way. “I know how it feels to choose the harder right,” talking about taking time off to treat an injury. “Soldier on.” We’ve all heard the saying, meaning tough it out and keep your mouth shut. Who’s tougher than a soldier? The 1st Infantry is trying to change the meaning of “soldier on” and show everyone that being tough means asking for help. That’s strong. In late 2012, Army Chief of Staff Gen. Raymond Odierno instructed leaders at all levels the Army refocus their efforts in the realms of suicide prevention. Despite a constant “attack” on suicide, the formation seemed to be losing ground in the effort to prevent soldier/family member suicide. Gen. Odierno asked Army leaders to focus their efforts on several key areas including stigma reduction, combating isolation, and resiliency. 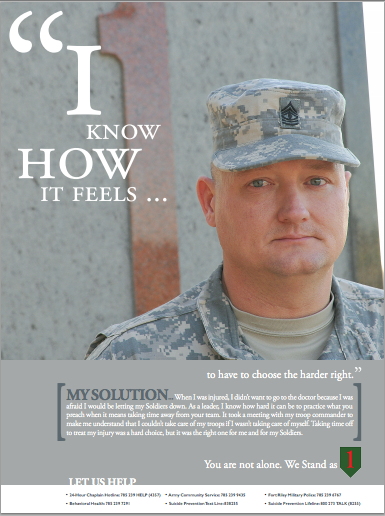 In an effort to communicate suicide prevention, stigma reduction and resilience messages to audiences who seemed to have turned a deaf ear to the traditional leadership-driven, buzz word-rich messages, the 1st Infantry Division Public Affairs team launched the “I Know How It Feels” Campaign. 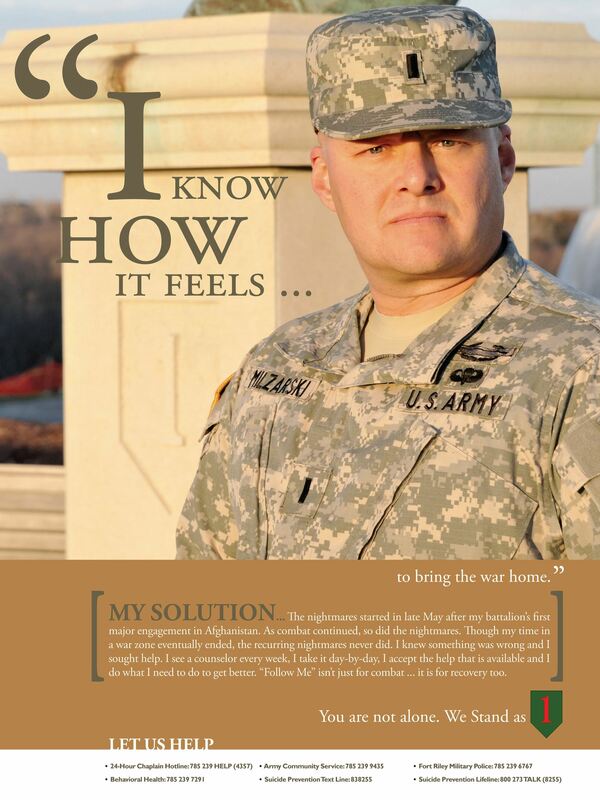 The posters feature actual soldiers, civilians and family members discussing their own personal struggles and what they did to overcome their challenges, like this one below featuring Lt. William Milzarski. Lt. Milzarski shares his story about the war he brought home and how he sought help for recurring nightmares that disrupted his life. Talking about feelings and getting help isn’t something anyone in the military is used to. So, it’s especially nice to see real soldiers brave enough to speak out. And it’s even more gratifying to see the positive response their honesty is bringing. The reaction has been outstanding. The audiences that we targeted (1st Infantry Division Soldiers and family members) as well as several secondary audiences (local community members, Army veterans, extended family members) have been praising this campaign here on post and throughout Facebook. Comments like “outstanding initiative” and “I wish the Army would have done something like this a long time ago” have followed every poster’s launch on Facebook. This is a campaign that all marketers should take note of–an example of how to target a tough audience and step into delicate territory at the same time. Follow the 1st Infantry Division on Facebook to see more of the fantastic things they do. And stay tuned to this blog, because I’m on the lookout for more powerful examples of using real-life stories in marketing, advertising and social campaigns to share with you. The fate and future of Abington Memorial Hospital suddenly is in doubt. After decades of building a reputation as the community hospital of choice in the Philadelphia suburbs, a decision made behind closed doors has torn that community apart. Doctors aren’t happy. Patients aren’t happy. Donors aren’t happy. What should the hospital do? And what lessons can businesses learn from Abington’s mistakes? Abington Hospital CEO Laurence Merlis agreed to a merger with Catholic hospital Holy Redeemer to form a new regional health system. The problem? He didn’t tell anyone, including his doctors. One of the stipulations of the merger is that Abington must stop performing abortions. You’ll hear many people mention that, but don’t get caught up in that polarizing topic. The real issue is that a secular hospital now finds itself wondering what Catholic-imposed rules doctors and patients will have to follow. This includes abortion, fertility services, stem cell procedures, end-of-life decisions and more. Lesson 1: Think of not just the benefits but the consequences your decision will create. How will your customers, your employees and your community feel and react? Two of the most critical things a leader can do when formulating and promoting a vision is to listen and measure. It’s something that Merlis has made a top priority at Abington. He wants his leadership team to get input on the future direction of the organization from all involved stakeholders — the board of directors, physicians, medical staff, office staff and support staff. Then, once the vision and strategy are formed, he manages by what he can measure and communicates that data back to employees to facilitate an ongoing dialogue. Oops! Where did that transparency go? Doctors and the community are now trying to hold those leaders—Merlis—accountable for their decision, yet the hospital is very slow to respond. Lesson 2: In Merlis’ own words: “You need to be sure that you are measuring yourself by what you said you would do.” Be authentic. Don’t claim to be transparent if you plan not to be. In this social age, delay in response is dooming. Leaders at Abington Hospital clearly dropped the ball. Did they, in arrogance, assume that people would acquiesce to their merger decision with no problems? That would be idiotic. In a community with a good number of Jewish and non-Catholic families, many of whom have contributed to the hospital, it’s a major slap in the face to suddenly turn their hospital into a Catholic one. A petition on Change.org got 1,000 signatures against the merger in less than 24 hours. It now has over 5,000. 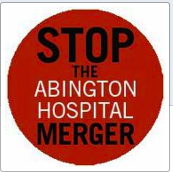 A Facebook page has been set up: Stop the Abington Hospital Merger. It has over 1,300 likes and lots of activity. Ms. Magazine blog has published an article about the merger and coverage continues to grow. Lesson 3: Respect your audience. Act quickly to at least acknowledge that the doctors and public have a valid response. Prove you are listening. Understand the problem you’ve created. So far, Abington Hospital’s response has been minimal and ineffective. Meg McGoldrich, AMH VP for Administration, reached out to the Facebook page owner, Rita Poley, to see if an “accommodation” could be reached. Her proposal? To establish an off-site facility for abortions. Completely missing the point. The danger of a subject like abortion is that people hear that word and choose sides, not paying attention to the other items at stake. This isn’t just about abortion. Our philosophy here is the staff are experts in how to get things done…We look to them for advice and recommendations on how to make things better when it comes to making ourselves a place for patients to receive care. He also disregarded the community his hospital serves. Right now, people who want Catholic services go to Holy Redeemer Hospital. Others have a choice that is now, in a sense, being taken away. Now, women and doctors don’t trust (and don’t want) this new Catholic influence on their care. Lesson 4: Know when to fold ‘em. Stop the merger for now. Listen to your audience and if you choose to go forward with the merger, incorporate the needs and concerns of your constituency. After Merlis stops the merger, which is the only (sane) thing to do at this point, he will have to work very hard to rebuild trust. Because he’s waited so long to address the issue with the doctors, employees and community, I’m afraid the only step for Merlis to take is to resign—with no golden parachute to ease his fall. Then Public Relations and Marketing will have to get into high gear working to undo the damage. My suggestion is to commit to transparency this time and make every next step obvious, public and in the best interest of the patients and the community. UPDATE: July 18. Abington and Holy Redeemer Hospitals announced they’ve called off the merger (short statement in the Philadelphia Inquirer).